Two games of football, two one-one draws, two points earned courtesy of two late equalisers; and yet for Burnley fans, two results stirring two very different reactions. The overriding emotion following the point gained at Newcastle in midweek was one of relief that the run of defeats had ended. The one gained at home to Manchester City yesterday, however, enabled Clarets fans to return homeward with a spring in the step and chests swelled with pride. Playing against this Manchester City team is tough, very tough. At the same time though, it is also a challenge and kind of a privilege. It is a little like being the support band for the Rolling Stones. Fortunately for Burnley yesterday, City gave a Stones performance where Keith plays a bum note and Mick forgets the words to “Satisfaction”. In the two previous encounters between the teams this season, Burnley contested the match for as long as they could, but were eventually swept aside by some precise attacking play and clinical finishing. When Danilo’s beautifully struck shot put City one-nil up yesterday, it seemed that the pattern would be repeated. Burnley however, were able to navigate the waves of pressure and answered back with some of their own. All in all, this was a proper game of football demonstrating all its wondrous varieties and was thoroughly enjoyed by the majority of those watching. 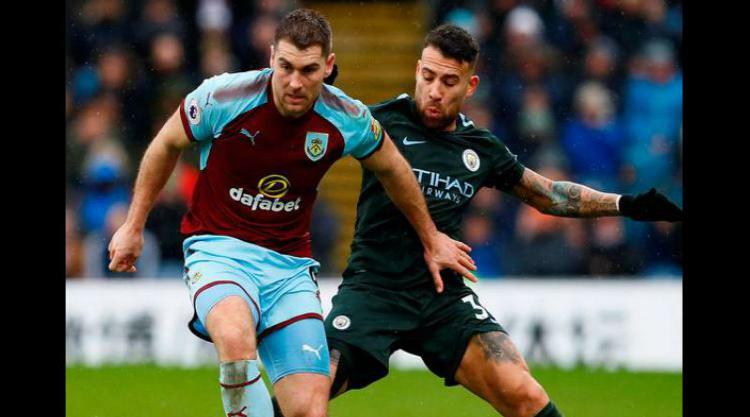 The recalled to the Clarets' ranks and Wales international centre forward Sam Vokes caused the City defence allsorts of problems with his partner in crime and accomplice, the rumbustious Ashley Barnes. The Clarets’ cause was helped in no small part by City’s profligacy in front of goal. Raheem Sterling hooking the ball wide of the post from three yards out was the most glaring, but other chances also went begging; Sergio Aguero, the scourge of Burnley in recent years, jinked his way through the Clarets’ penalty area and missed when most in the stadium and watching on TV fully expected to see the net bulge. Burnley drew strength for those wasted chances and began to get a foothold in the game. Jack Cork exerted an increasing influence in midfield; Johann Berg Gudmundsson gave England’s Kyle Walker a torrid time down the Burnley left and Sam Vokes and Ashley Barnes went toe-to-toe with Vincent Kompany and Nicholas Otamendi. Aaron Lennon gave an impressive second half showing on his home debut and saw his powerful shot turned onto the crossbar by Ederson in the City goal and this near miss stirred the Burnley crowd and then seemed to infuse the Burnley players with belief. A superbly flighted cross from half-time substitute Matt Lowton picked out Gudmundsson’s surging far post run, the Icelander applying a deftly controlled half volley finish to provide a 82nd minute equaliser and secure a valuable point for Sean Dyche's brave battlers. Pep Guardiola’s decision to name only six substitutes, citing injuries as the reason, seems more than a little precious, given City’s bottomless resources. It is worth noting that Burnley, too, had six of their regular starters absent through injury, yet Sean Dyche could still summon up sufficient bodies to fill the bench. Guardiola spent some time during the week calling for referees to provide his players with greater protection from rash challenges. It was a concern that yesterday’s referee, Martin Atkinson, would be unduly swayed by this. But from one who has had cause to be critical of a number of referees this season, I am happy to report that Mr Atkinson’s application of the laws in yesterday’s game was exemplary and worthy of some acknowledgment. For Burnley, let's use this result and the manner in which it was achieved, as a springboard to re-energise the season. Europe beckons!